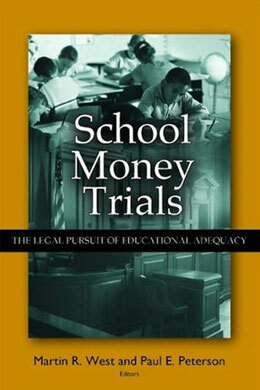 In School Money Trials, thoughtful contributors consider this growing phenomenon from several different viewpoints. For example, they investigate the legal theory behind adequacy lawsuits, examining how courts have interpreted the education clauses in state constitutions. Education policy analyst Frederick Hess looks at the politics of implementing adequacy judgments. Research by Christopher Berry finds that the adequacy movement has not yet resulted in broad changes in school funding. Andrew Rudalevige and Michael Heise address how the No Child Left Behind Act and adequacy lawsuits affect one another. And according to authors Matthew Springer and James Guthrie, adequacy litigation has more fully politicized the process of cost modeling in school finance. This is the most comprehensive analysis to date of the adequacy lawsuit, a topic of increasing importance in a controversial area of public policy that touches virtually all Americans. It will be of interest to readers engaged in education policy debates and those concerned about the power of the courts to make policy rather than simply to enforce it.